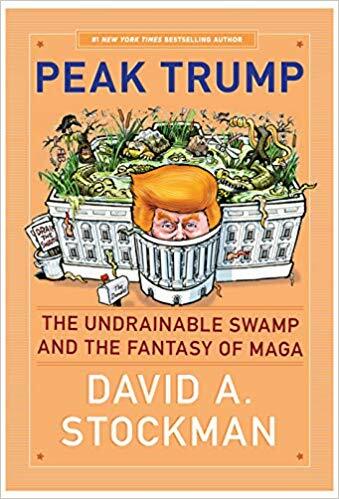 In this meticulously researched and inside account, PEAK TRUMP: The Undrainable Swamp and The Fantasy of MAGA, Stockman asserts that the Donald is headed for a great big fall stemming from 30 years of a failed financial bubble---one which Trump condemned on the campaign trail, but foolishly embraced once in office. Stockman writes, "the Donald is not remotely the force of nature he's been made to seem by the Trump-obsessed media. To the contrary, he's actually a political flyweight, megalomaniacal incompetent and bile-ridden bully who stumbled into the Oval Office against all odds; and then lucked-out a second time by riding high on the final two-year crest of a deeply impaired and unsustainable economic recovery and monumental stock market bubble". According to Stockman, who has seen every business cycle and President since he started as a legislative assistant on Capitol Hill in 1970: "The Donald committed the most egregious rookie mistake in the history of the American presidency. That is, he insouciantly embraced a financial bubble that was destined to crash and took ownership of a struggling, geriatric business cycle expansion that had "recession ahead" written all over its forehead". Stockman heralds Trumps role as the Great Disrupter, whose lasting contribution will be to discredit "the handiwork of Imperial Washington and the self-serving consensus of its bipartisan ruling class in favor of permanent war, unchained entitlements, fiscal incontinence, unsustainable debt-fueled household spending, rampant corporate financial engineering and Keynesian monetary repression and 'wealth effects' central planning at the Fed." At the same time, Stockman insists that Trump has no real program to restore the American economy and that he "has actually made matters inestimably worse with his misbegotten Trade Wars, Border Wars, Fed-bashing and Fiscal Debauch." On the foreign policy front, Stockman praises Trump for attempting to roll back the Empire and bring American forces home, but notes that Trump's "America First foreign policy has mostly been stymied, smothered and sabotaged by the Deep State incumbents who continue to run the government. And that's been abetted in no small measure by the phalanx of failed generals and neocon interventionists that Trump has unaccountably installed in key offices." As to the "undrainable swamp", Stockman insists that its deep-end lies on the Pentagon side of the Potomac, but that Trump has fed the military/industrial/surveillance complex like never before, thereby defeating his own stated goal: "...the desperately needed pivot to fiscal and national security sanity was stopped cold by the Donald's mindless $100 billion per year boost of an already vastly excessive and waste-ridden national defense budget. And now that crucial pivot has been further blocked by a reckless economic and political war against Iran that will do exactly nothing to further the security and safety of the American homeland." TRUMPED! 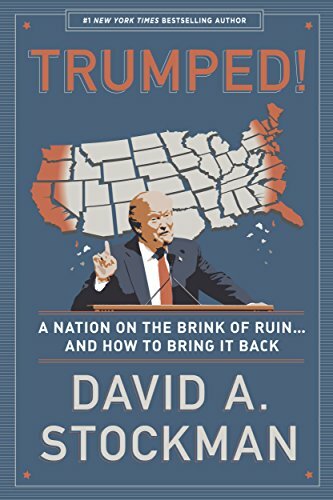 A Nation on the Brink of Ruin… And How to Bring it Back is based on the upheaval represented by the Trump candidacy and movement. It is an exploration of how 30 years of Bubble Finance policies at the Fed, feckless interventions abroad and mushrooming Big government and debt at home have brought America to its current ruinous condition. It also delves into the good and bad of the Trump campaign and platform and outlines a more consistent way forward based on free markets, fiscal rectitude, sound money, constitutional liberty, non-intervention abroad, minimalist government at home and decentralized political rule. 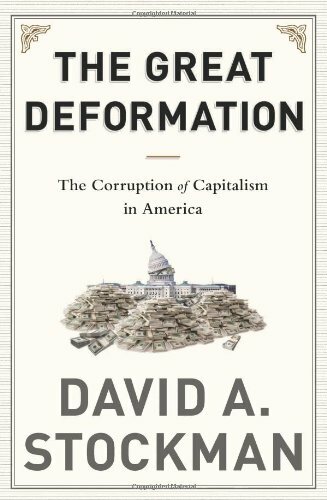 The Great Deformation is a searing look at Washington’s craven response to the recent myriad of financial crises and fiscal cliffs. It counters conventional wisdom with an eighty-year revisionist history of how the American stateespecially the Federal Reservehas fallen prey to the politics of crony capitalism and the ideologies of fiscal stimulus, monetary central planning, and financial bailouts. These forces have left the public sector teetering on the edge of political dysfunction and fiscal collapse and have caused America’s private enterprise foundation to morph into a speculative casino that swindles the masses and enriches the few. Defying right- and left-wing boxes, David Stockman provides a catalogue of corrupters and defenders of sound money, fiscal rectitude, and free markets. The former includes Franklin Roosevelt, who fathered crony capitalism; Richard Nixon, who destroyed national financial discipline and the Bretton Woods gold-backed dollar; Fed chairmen Greenspan and Bernanke, who fostered our present scourge of bubble finance and addiction to debt and speculation; George W. Bush, who repudiated fiscal rectitude and ballooned the warfare state via senseless wars; and Barack Obama, who revived failed Keynesian borrow and spend” policies that have driven the national debt to perilous heights. By contrast, the book also traces a parade of statesmen who championed balanced budgets and financial market discipline including Carter Glass, Harry Truman, Dwight Eisenhower, Bill Simon, Paul Volcker, Bill Clinton, and Sheila Bair. Stockman’s analysis skewers Keynesian spenders and GOP tax-cutters alike, showing how they converged to bloat the welfare state, perpetuate the military-industrial complex, and deplete the revenue baseeven as the Fed’s massive money printing allowed politicians to enjoy deficits without tears.” But these policies have also fueled new financial bubbles and favored Wall Street with cheap money and rigged stock and bond markets, while crushing Main Street savers and punishing family budgets with soaring food and energy costs. The Great Deformation explains how we got here and why these warped, crony capitalist policies are an epochal threat to free market prosperity and American political democracy. 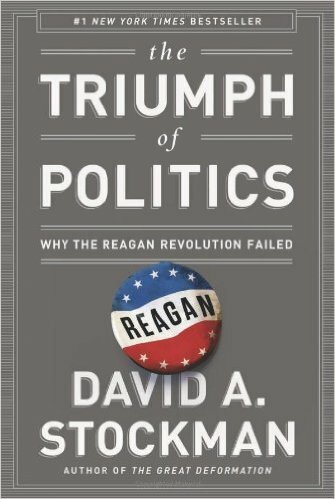 As Director of the Office of Management and Budget in the early 1980s, David Stockman was a chief architect of the Reagan Revolutiona bold plan to cut taxes and reduce the scope and cost of government. The Triumph of Politics was Stockman’s frontline report of the miscalculations, manipulations, and political intrigues that led to its failure. A major publishing event and New York Times bestseller in its day, The Triumph of Politics is still startling relevant to the conduct of Washington politics today.